This month sees the 60th anniversary of the historic first ascent of Everest by Sir Edmund Hillary and Sherpa Tenzing Norgay, on 29 May 1953. This year's aspiring summiteers are already well on their way and – despite the scuffles that broke out recently between sherpas and mountaineers – Nepal's spring trekking season is in full flow. Whether it's the Himalayan foothills, Everest Base Camp or its treacherous summit you aspire to, you'll inevitably spend time in Kathmandu. Nepal's capital city has a reputation for being overcrowded and polluted. But beyond the grime, there's grace. Kathmandu's charisma shines through its chaos in the ancient temples and Buddhist stupas that earned it World Heritage Site status, and in its narrow streets and crumbling medieval homes with intricate wooden carvings. There are no direct flights from the UK to Kathmandu's Tribhuvan airport, 6km east of the city. Qatar Airways (0844 846 8380; qatarairways.com) and Etihad (0845 608 1225; etihadairways.com) fly from Heathrow and Manchester via Doha and Abu Dhabi respectively. Many hotels arrange free pick-ups; taxis charge fixed fares, currently 600 Nepali rupees (600NPR/£5) for the half-hour journey to Thamel, the main tourist area. British citizens need a visa for Nepal, available on arrival (from US$25/£17) or prior to departure from the Nepal embassy in London for £20 (020-7229 1594; nepembassy.org.uk). The old city, known as Durbar Square (1), lies at the centre of Kathmandu. To its north, frenetic Thamel is a maze of hotels, restaurants, trekking agencies and shops. To the south, the Bagmati River borders peaceful Patan district with its own Durbar Square and expatriate communities. Beyond the former Royal Palace (2) to the east are the smarter shopping centres and embassies. Local tempos (minibuses) and buses are best avoided – they're crowded, slow and not the safest. However, taxis are cheap and plentiful and rickshaws can be a useful way of travelling short distances. The tourist office (3) (welcomenepal.com; open 10am-5pm from Monday to Friday) is located off Thamel North. Kathmandu's best hotel is Dwarika's (4) at Battisputali, a beautifully preserved Newari building – convenient for the airport but not the city centre (00 977 1 447 9488; dwarikas.com). Doubles from US$295 (£197), room only. Kathmandu Guest House (5) in Thamel Northwest (00 977 1 470 0632; ktmgh.com) combines a great central location with a peaceful garden that feels as though it's miles from Thamel's madness. "Ultra-basic" double rooms cost from US$4.90 (£3.25); new suites cost from US$221 (£147), excluding breakfast. Café de Patan (6) in Patan Durbar Square (00 977 1 553 7599; cafedepatan.com) is a simple, boutique guesthouse with a popular café and just eight rooms overlooking ancient temples. Doubles from 1,107NPR (£8.25), excluding breakfast. 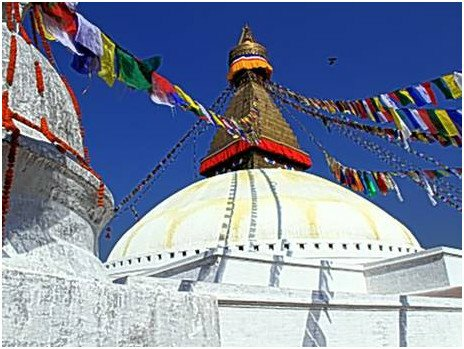 Get trek-fit by climbing the 400 steps to Swayambhu Temple (7), known as the Monkey Temple after its primate residents (6am-7pm daily; entry 200NPR/£1.50). The city sprawls out below you, and on a clear day Kathmandu Valley's landmarks are visible. Even if it's hazy, the fifth-century temple with its beautiful Buddhist stupa and golden spire are worth the climb. Ancient Durbar Square (1) cries out to be explored. Its palaces, shrines and temples, built between the 12th and 18th centuries, bustle with flower sellers, pilgrims, orange-clad Sadhus and tourists. Enter by Narayan Temple at the Thamel end, where the ticket office has detailed maps (7am- 7pm daily; entry 750NPR/£6). Kumari, the living goddess, resides in Kumari-ghar five minutes' walk south. Before noon or after 4pm, she might even grace you with an appearance at her window. Take a circular route to the north as far as Mahendreswor Temple, returning via the impressive Taleju Temple, so revered it opens only once a year for Dashain festivities. You can see exceptional views of the whole complex from the ninth storey of the Basantapur Durbar Temple. Not one for vertigo sufferers. Head to the rooftop Kasthamandap Restaurant (8) (00 977 1 424 0770) at the southern edge of Durbar Square for good views and momos, a local speciality of steamed vegetable or chicken dumplings with a spicy peanut dip (200NPR/£1.50). It's often cheaper to organise treks once in Kathmandu, but with more than 500 agencies, choosing can be tricky. Personally tried and trusted operators include: Swiss Nepal Family Trekking (10) (00 977 1 421 2911; trekking-in-nepal.net; closed Saturday) on JP Marg; For trekking gear, try Shona's (12) on Jyatha (00 977 1 426 5120) for fair fixed prices (no bargaining) and good quality. They rent down jackets, sleeping bags and equipment. Then lose yourself in the warren-like Pilgrims Bookshop (13) (00 977 1 470 0942; pilgrimsbooks.com) near Kathmandu Guest House (5). New Orleans Bar (14) (00 977 1 470 0736), just off Thamel Northwest, is a laid-back bar in a Newari courtyard, with live Nepali folk and fusion music on Wednesdays and Irish folk and blues on Saturdays. Cocktails from about 300NPR (£2.20); local Everest Beer 350NPR (£2.60). Well-heeled locals head to Chimney Restaurant at the Yak & Yeti (15) on Durbar Marg (00 977 1 424 8999; yakandyeti.com). This was Kathmandu's first hotel when it was opened in the 1950s by Russian ballet dancer turned adventurer Boris Lissanevitch. Original dishes such as borscht, chicken stroganoff and vegetable Kiev are still served. About 8000NPR/£60 for a two-course meal for two, including wine. Less well-heeled locals swear by Royal Saino Special Momo restaurant (16) (00 977 1 423 0890) an incongruously small venue amid glitzy shops and banks on Durbar Marg. The vegetable momo platter costs 205NPR (£1.50). Bodhnath Stupa (17) is one of the world's largest Buddhist temples, with a striking white dome like a ridiculously oversized ice cream bombe. Pilgrims and tourists walk clockwise around the stupa to the melodic strains of the Buddhist chant "Om mani padme hum" floating from pirate CD stalls around the square. This is one of the most peaceful places in the city (open daily, 7am to 7pm, entry 150NPR/£1). Take a taxi over to Mike's Breakfast (18) in Naxal (00 977 1 442 4303; mikesbreakfast.yolasite.com). It's worth the trip for its renowned American style "Country" breakfast, eggs Benedict, Mexican options and great pancakes (open 7am to 9pm, daily). It was at the Narayanhiti Palace (2) on Durbar Marg (00 977 1 422 7844; narayanhitipalacemuseum.gov.np) that the hugely respected king and queen and seven other family members were shot dead by their son, Dipendra, in 2001. The public's intense dislike of the new King Gyanendra, and his son Paras, helped Maoist insurgents to succeed and led to the dissolution of the monarchy after the 2008 elections. The Maoist government then destroyed the massacre site, leaving only brick ground markers to show where each individual was killed. The rest of the palace is intact, but it's an ugly pink Sixties monstrosity (summer, 11am-4pm daily except Tuesday and Wednesday; to 3pm in winter). Visit the aptly named Garden of Dreams (19) (00 977 1 442 5340; gardenofdreams.org.np), just a minute's walk yet a world away from touristy Thamel. Field Marshal Kaiser Shumsher Rana built the garden in the 1920s, inspired by his love of horticulture, travel and art. A joint Nepali-Austrian restoration project began in 2002 and today it's a graceful, romantic oasis of palms, wisteria, bougainvillaea, fountains, moats and a lotus pond in the centre of Kathmandu's chaos (open daily, 9am to 10pm, admission 160NPR/£1.50). A contender for the world's most scenic flight is a trip in a turbo-prop plane past Everest. Buddha Air (buddhaair.com) and Yeti Airlines (yetiairlines.com) both offer one-hour trips from the domestic terminal at Tribhuvan. Tickets cost US$183/£122. About 20 flights leave daily (6.30am to 10am) but note the FCO says aviation standards in Nepal are "well below the global average", and warns bad weather could "increase the risk to your safety".